Save 30% off select ID solutions now at Entrust Datacard. Act now and save 20% off 2 year standard SSL certificates from Entrust Datacard. Enjoy 2018 Holiday Special now when you shop at Entrust Datacard. 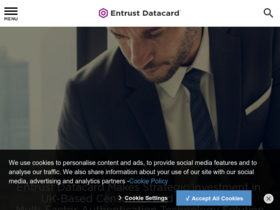 Check out Entrust Datacard online for their latest special offers.